The Fellowship was fortunate enough to obtain a copy of COLDER #3 from Dark Horse Comics. 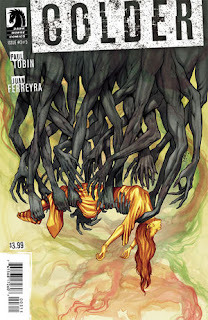 Paul Tobin writes, and Juan Ferreyra draws. Declan’s life was complicated enough, but now he’s had to introduce Reece to Nimble Jack. And if you know Jack, you know that this was not in a pleasant way. Not surprisingly, Reece will have some difficulty getting her mind around this. Declan gets them away from him this time, but it costs him in more than one way. I’ve always been a big fan of stories that deal with insanity in some way. It gives the writer (and the reader) more leeway with causes and effects; it allows people to react differently than we might think they should. It opens up the possibilities, and this story does that in a big way. Declan’s abilities are downright freaky, but he’s the good guy, and that barely even hints at the scale that Jack works on. Long story short, who knows what it will take for Declan to stop Jack? This is the kind of story that makes me love reviewing comics. It forces readers out of the box and makes them doubt everything. And it does so brilliantly. Oh, and the bum’s sign is priceless. COLDER #3 is available now at your FLCS or by order from darkhorse.com.